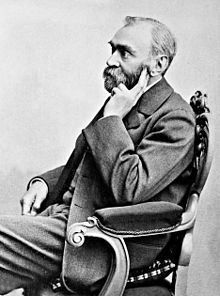 Alfred Nobel (21 October 1833 – 10 December 1896) was a Swedish chemist, engineer, innovator, armaments manufacturer and the inventor of dynamite. In his last will, he used his enormous fortune to institute the Nobel Prizes. I would not leave anything to a man of action as he would be tempted to give up work; on the other hand, I would like to help dreamers as they find it difficult to get on in life. As quoted in Nobel, Dynamite and Peace (1929) by Ragnar Sohlman and Henrik Schück, as translated by Brian Lunn and Beatrix Lunn, p. 249; also quoted by Lester B. Pearson in his address on accepting the Nobel Peace Peace Prize in Oslo, Norway (10 December 1957). As quoted in The 12 best Questions To Ask Customers (2001), by Jim Meisenheimer, p. 26. Justice is to be found only in the imagination. The best excuse for the fallen ones is that Madame Justice herself is one of them. This page was last edited on 28 May 2018, at 06:53.